What!!! You haven’t created a responsive eLearning course yet using Adobe Captivate 8 or 9? Well, I hate to inform you, but you are already behind the times. So let me help you get with it and get with it fast!!! A little bit of history on my experience with responsive design. I am NOT a coder. I am not prolific with HTLM or CSS. 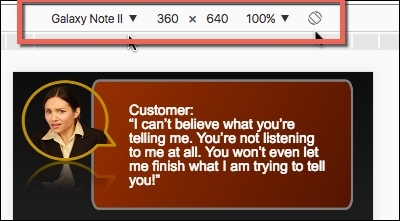 That is why I love Adobe Captivate’s ability to provide responsive design. I helped Kevin Siegel write his chapter on Responsive Design when Adobe Captivate 8 was released and since then, I not only, teach Responsive Design for Iconlogic, but have presented at several conferences on responsive design. And I don’t just talk the talk, I have developed responsive design e/mLearning courses for a variety of customers since Adobe Captivate 8 was released. Before I go in to how to create your first responsive eLearning course, let me explain why you should embark on the journey from eLearning to mLearning. There are over a billion smart phones around the world. 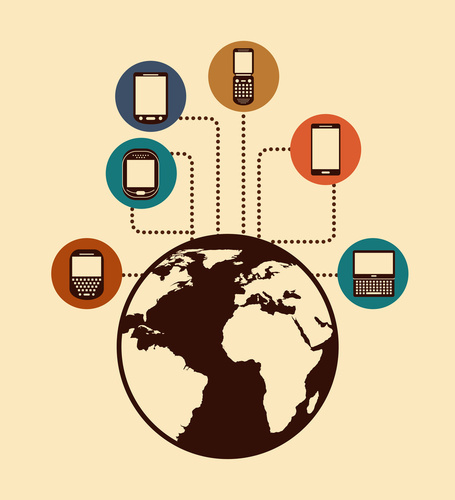 Mobile learning is already a 5.3 billion-dollar industry. 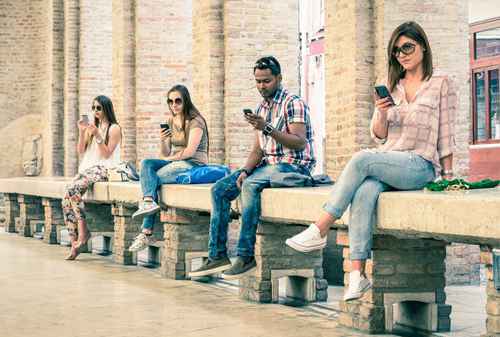 Out of the 91% of adults who own cell phones, 63% of them use their phone on-line. Studies show that mobile learning increases motivation and attendance, which therefore, means increase in retention and productivity. The majority of organizations recognize the importance of mobile devices and have already implemented a mobile learning strategy. It is predicted that by 2018, 70% of professionals will do some work from their own personal phones after hours and while traveling. 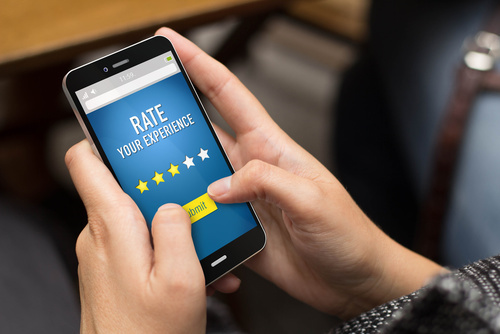 and 72% of organizations who are using eLearning believe it is providing them with the competitive advantage by providing real-time on-demand training. The big gest benefit to online learning on multi-devices is that it ensures you are in sync with today’s young and modern learner. Delivering effective, self-paced content that learners can access anywhere, motivates them and produces better results in retention and production. The reality is that all eLearning designers/developers need to take mLearning design into consideration from the outset. 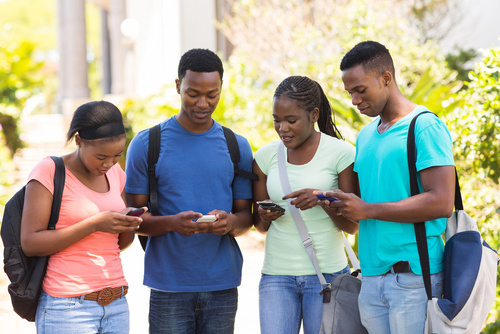 Because the reality is that learners can be learning on any size device. Note: These steps should be taken AFTER you have already written your storyboard, created a design for each size device, and have a company branding that you will use. Ready to go in to a deeper dive? After you open a responsive project, the first thing you’ll need to decide what size your breakpoints are going to be and how many you want to include. The minimum is 3 and the maximum 5. Click on the + signs to add more break points. 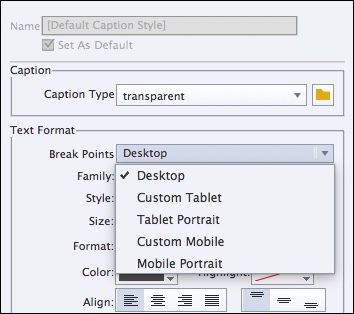 Note 1: if you are using Captivate’s default playbar for the desktop and Tablet breakpoints, you will want to leave them at 627. If you are creating your own custom playbar you could change the height to 768. However, the mobile (phone height) will depend on which phone size you are targeting. Note 3: If you change the Slide Height of that particular slide (this is not global throughout the project, it is unique for that one slide). So if the Slide Height is 667 and the Device Height is 568, the learner will have to scroll to view the content below 568. As with all projects, you need to insert your content into either Captivate’s library and then onto the slides or directly onto the slides. 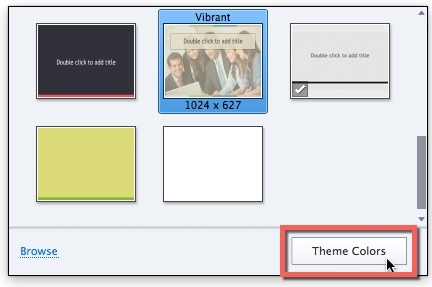 Ensure you are on the Desktop breakpoint when you insert content onto your slide. When you have an object selected on the slide, your Position Properties tab will appear. If it does not go to Window > Position Properties. This is the nuts and bolts of creating responsive projects. 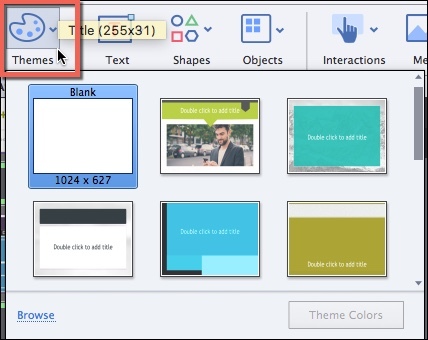 Apply layout views unique properties by controlling the size and position of the objects on the slide. As you will see by the above image, the objects size and position is based on percent relative to the size of the device. You need to understand some definitions. 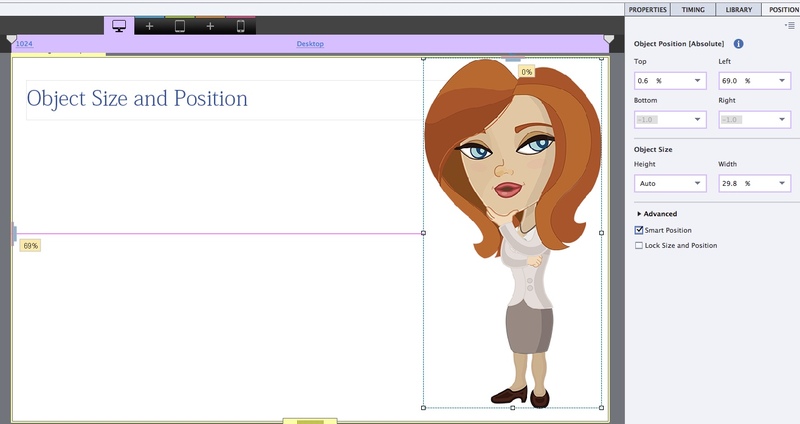 Smart Position – Use this option to view the lines of positioning of the object in the project. % – Choose percent for object dimension or position to be a percentage of the Stage width or height. Pixel – If you want object dimension or position to be a fixed width or height. Auto – Maintains aspect ratio. % Relative – This option maintains the overlay position. Appears only to height-related properties. You can also use % Relative to link objects. Text: You can create responsive text for all break points by using Edit > Object Style Manager. Here you can select the type of object, and change the properties for each break point. Aligning: You can also align objects to stick to the center either horizontally and/or vertically by expanding the Advanced section in the Position Properties. Software simulations. When you add software simulations into a responsive project, Captivate automatically makes it responsive, you don’t have to do anything other than create the simulation and edit the captions as before. To insert a software simulation, you must have a responsive project open and then go to the Slide + icon and select Software Simulation. Drag and Drop interactions are responsive. 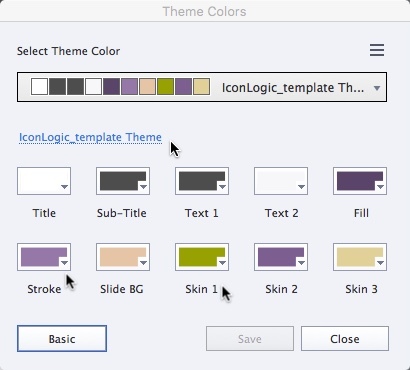 To insert a drag and drop go to Interaction and select Drag and Drop. 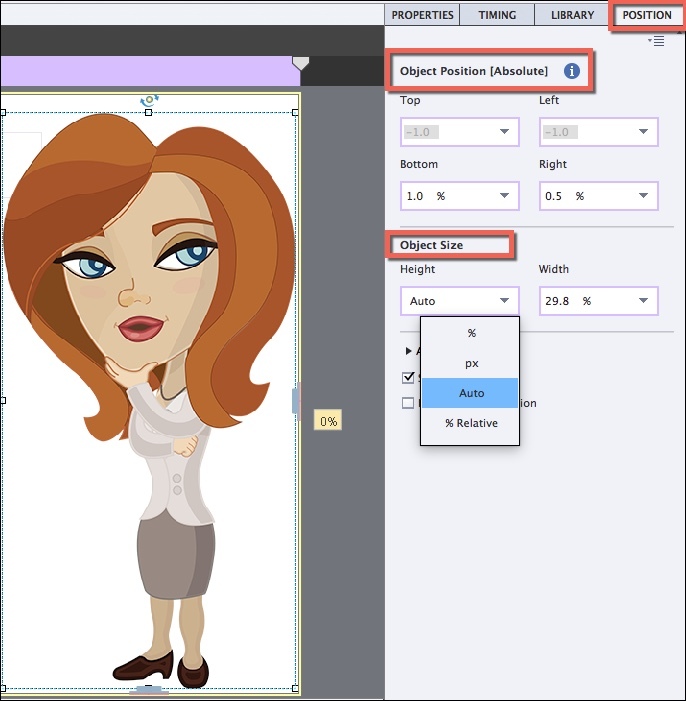 Create the drag and drop interaction as you would a non-responsive project. When you preview a responsive project it always opens in our default HLTM5 browser. You can use the slider to view how the objects will adjust on any size device. When you drag the slider, you will see the a number in the middle of the screen that shows you the horizontal size of the device. Always publish and test your courses on the specific device or use a browser like Chrome that allows you to have developer tools to see how the course will look on specific size devices. Go to Chrome Settings > More Tools > Developer Tools and adjust the size device and the orientation from there. It is because what Adobe calls as ,,responsive design” inside Captivae, is not really responsive design – this is adaptive/fluid layouts systems, wich depends of 3 or 5 key points and break from one to another layout of ,,3 or 5 versions of layout”. That is, why you have some white space around layout of your course. 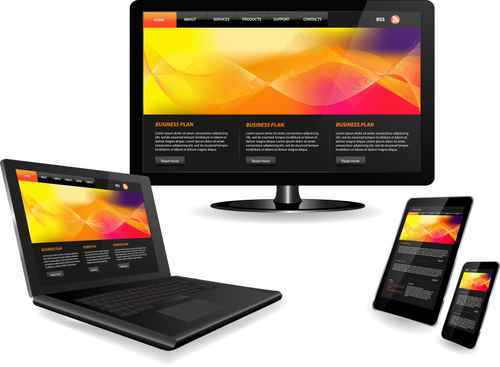 Tru responsive design have only one layout, fully responsive to with and height of device. You’re absolutely right Jaroslav. Hopefully, Adobe can improve on the software’s “responsive” capabilities in future updates. 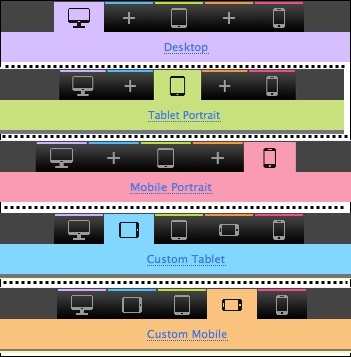 True responsive design adapts for any device and/or device orientation. From what I’ve seen and read, Adobe wants developers to target specific devices. Every setting I’ve tried on mobile devices resulted in 50 to 200 pixels of white space at the bottom of the screen (portrait orientation) or scrolling (landscape orientation). Hopefully, Adobe can implement a framework similar to Bootstrap in later releases. You are correct, the height is specific to the breakpoint but the horizontal is truly responsive. I am having the same issue. I am getting white space at the bottom. 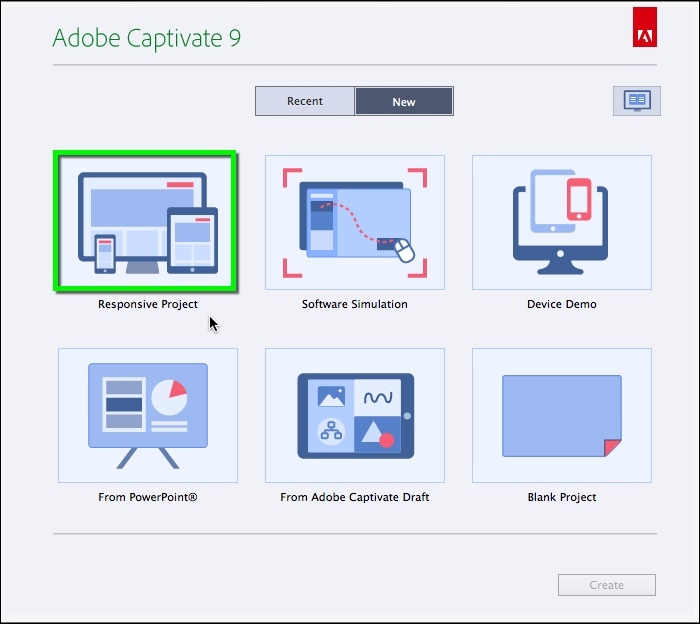 that’s a big fault captivate 9. captivate must improve the responsive feature in future updates. A feature I find useful is that Captivate color codes those object position/size properties to match whichever view is currently controlling them. Great article Anita – will there be a follow up article on Publishing As Apps ?